The Mini Casting Kit is a smaller version of our Super Casting Kit and is perfect for someone who is casting a small project or is a first time caster. 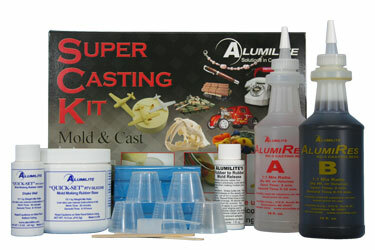 The Super Casting Kit contains everything you need to make a mold and cast a part. 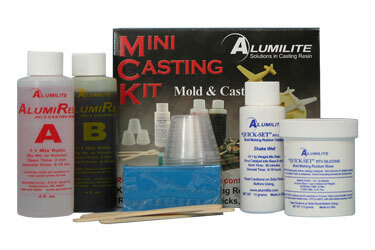 The Super Casting Kit is perfect for the beginner to moldmaking and casting. 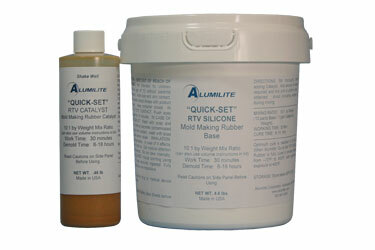 Alumilite's QuickSet silicone mold making rubber is one of our most easy to use silicones. It is great for making simple one and two piece molds that does not require extreme stress or flexibility. Its low viscosity gives you excellent detail reproductions of your original without requiring vacuum degassing (always recommended if available). The QuickSet is a tin base silicone. Temperature and humidity may affect the work and cure speed of the rubber. 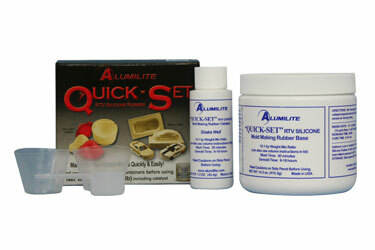 The QuickSet cures against all different types of clays including sulfur based with any problems of inhibition. The QuickSet is a great general purpose rubber for making 2 piece molds that need good alignment to one another. QuickSet exhibits good overall dielectric properties for electronic applications.